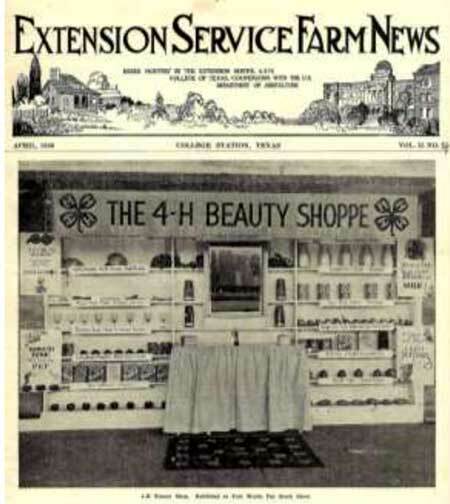 The front cover of the April, 1930, issue of Extension Service Farm News, issued by the Extension Service, A & M College of Texas, features a photo of a 4-H Beauty Shop exhibit at the Fort Worth Fat Stock Show. Visitors to “Secrets of Feminine Charm,” found the popular exhibit in the girls’ division of the home demonstration booths. Frequent inquiries came to Miss Mae Belle Smith and Miss Mary Powell who arranged it. The brief article noted that “those who viewed the exhibit were inspired with hopes of immediate transformation by this simple and effective method.” As the article questioned, whoever dreamed that onions were eye sparklers; or that business women used heads of lettuce and cabbage for vanity cases? When did a baked potato become a powder puff, or apples a skin softener; or milk a vanishing cream? Maybe Fort Worth 4-H’ers can reprise that exhibit for “Voices of 4-H History,” film it and answer those burning questions?